CSR | Tokai Carbon Co., Ltd.
As a comprehensive carbon manufacturer, Tokai Carbon works to develop useful technology that will enrich our lives, society and the planet. Conscious of the social and environmental challenges on the horizon, we embrace our duty as a company toward society, which is more important now than ever before. At the Tokai Carbon Group, our business activities are founded in our corporate philosophy, Strength in Trust. This represents the underlying belief that our greatest strength lies in mutual trust we have developed with stakeholders. Grounded in this belief, our CSR activities focus on compliance, the environment, and social contributions. Each member of the Tokai Carbon Group embraces and proactively engages in CSR to ensure we are able to make wide-reaching and continuous contributions to social development. The Tokai Carbon Group has outlined the following Environmental Philosophy and Environmental Policy to promote environmental conservation activities. The Tokai Carbon Group has outlined the following Environmental Philosophy and Environmental Policy to promote nvironmental conservation activities. Work to maintain and improve environment management system and conduct environmentally-conscious corporate activities. Work to protect the global environment through resource conservation, energy conservation, minimizing industrial waste, and reducing emissions of greenhouse effect substances and toxic substances. Adhere to laws, ordinances, and agreements related to the environment and, as necessary, outline voluntary management standards to work towards environmental protection. Use environmental education to elevate environmental awareness and participate in local environmental conservation activities to protect the local environment and improve communication. ISO14001 is a set of international standards for an environment management system. They are important standards for companies wanting to engage in environmentally-conscious corporate activities. Tokai Carbon has been working actively to get ISO14001 certification. 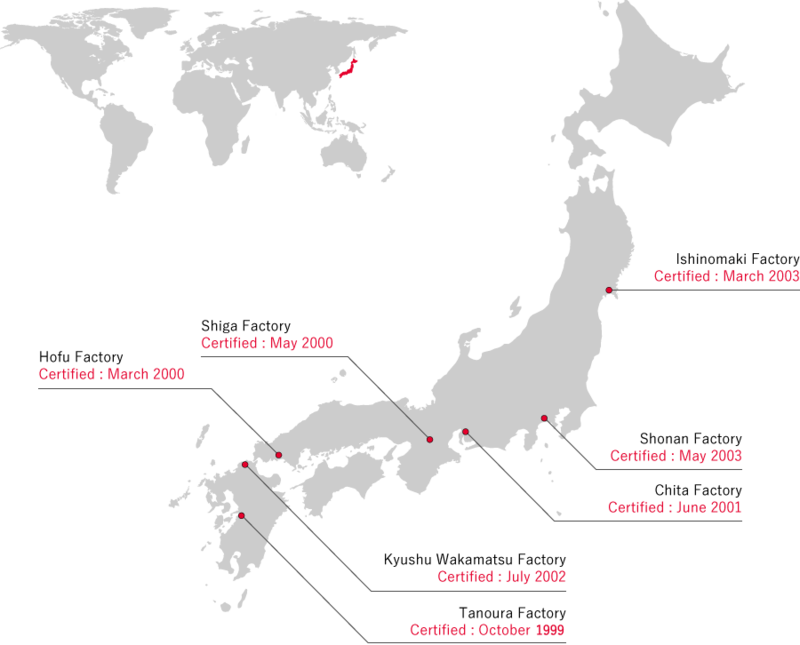 In May 2003, the Shonan Office (now the Shonan Plant) was certified, meaning that all seven production centers are now certified. At Tokai Carbon, we aim to work in harmony with the environment and help to achieve a sustainable, recycling-oriented society. To that end, we make it a management priority to reduce our basic unit of CO2 emissions and industrial waste. A lot of the work done at our plants depends on electric power. One of our priorities is to take a range of actions to reduce the quantity of electricity we use. We have also set reduction targets for the volume of industrial waste that ends up in landfill. This has led to a bigger reduction in waste compared to the previous system, when we only had reduction targets for consigned treatment volume. The volume of CO2 emitted varies with each rise and fall in production volume. The basic unit of emissions is a measurement that also varies complexly according to production. With this in mind, Tokai Carbon will continue to take realistic action to sustainably reduce basic unit of CO2 emissions, without being distracted by short-term successes and failures. In this report, we calculate Tokai Carbon's CO2 emissions volume based on our usage of a wide range of fuels and raw materials. Calculations are based on "Commitment to a Low Carbon Society", a policy of the Ministry of Economy, Trade and Industry and the Japan Business Federation. In addition, to better measure the effects of our efforts toward more efficient production and energy-saving, we have used a consistent CO2 emissions coefficient to calculate CO2 emissions from electric power. Production of our two core products, carbon black and electrodes, has been sluggish in the face of harsh external conditions, including the bankruptcy of Lehman Brothers and the East Japan Earthquake, and later the depreciation of the yen, drop in crude oil prices and strong growth in other Asian economies. In 2013, production finally stopped dropping, and it started to pick up from 2014. 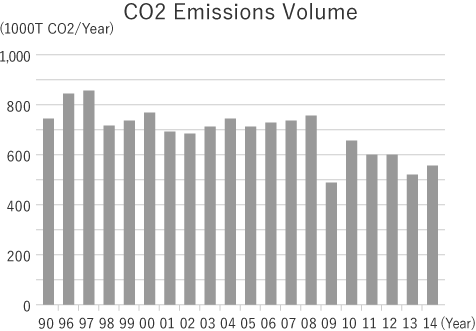 As a result, CO2 emissions volume has increased slightly from the previous year. All divisions and plants made a concerted effort to optimize energy use. As a result, we were able to reach our target. However, some plants did not achieve the expected improvement on the previous year. 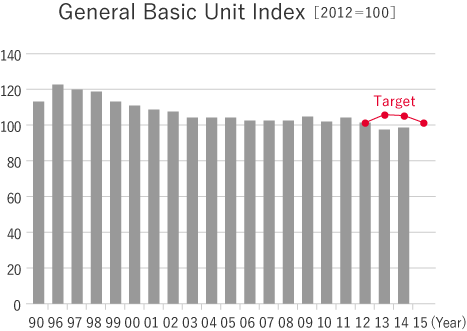 We will continue to stick rigorously to reducing energy consumption with an eye on the 3-year target. A reduction in waste from large-scale construction has contributed greatly to an overall reduction in waste volume. However, we are still working actively toward further waste reduction, setting a new reduction target for landfill waste. At Tokai Carbon, we are ever more aware of the need to reduce industrial waste, and some plants have succeeded in exploiting the value of secondary materials (that is, materials that can be used again after recycling). However, progress has been slowing down. Some plants are taking steps to limit the amount of industrial waste generated at each work site by monitoring the volume of waste brought to collection points. Going forward, we will work to further reduce the volume of consigned treatment waste by ensuring that waste is properly sorted and reused where possible. In addition to reducing consigned treatment volume, we are working to recycle more industrial waste and reduce the amount that ends up in landfill. Thanks to active engagement across all our sites, we are making progress year by year. Copyright© Tokai Carbon Co., Ltd. All rights reserved.